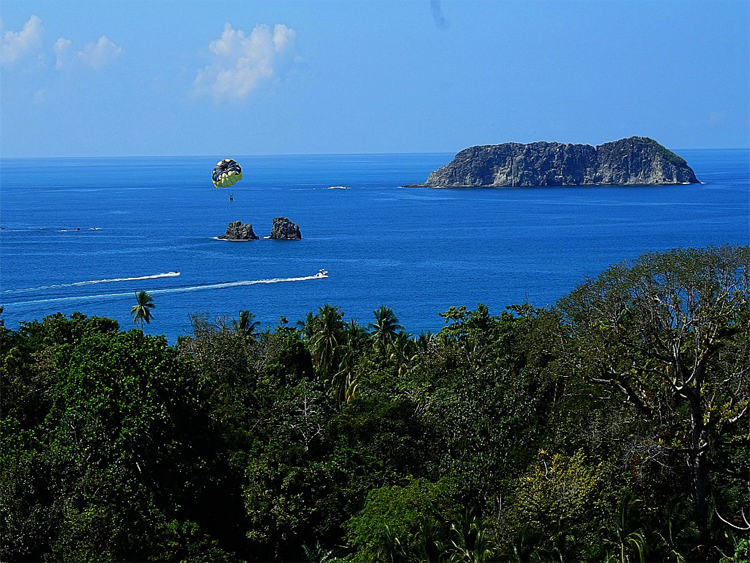 El Faro Beach Hotel in Manuel Antonio, a must-see destination in Costa Rica, is the best choice for the money in the area. It is all about the views and location, but the rest will not disappoint. With many activities nearby, it is a great base for action adventures. 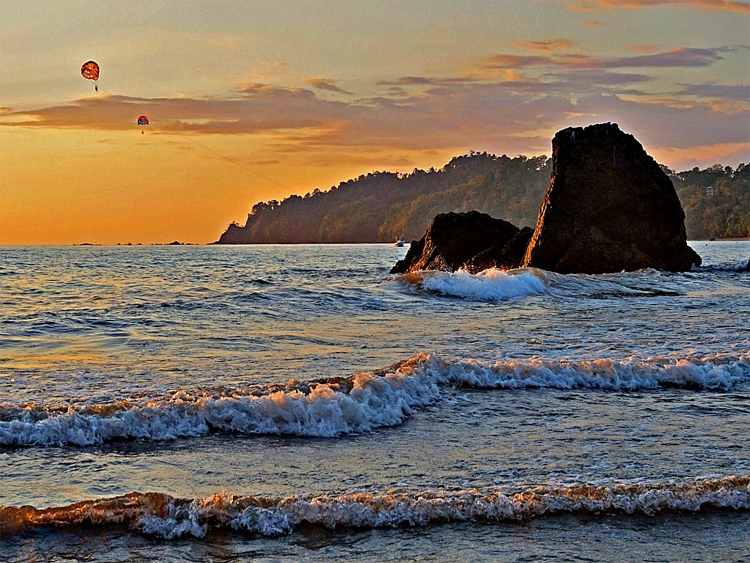 It is also perfectly situated next door to Manuel Antonio National Park where you will find spectacular beaches and rich variety of wildlife. If simple relaxation is on your mind, there is no need to leave the hotel. 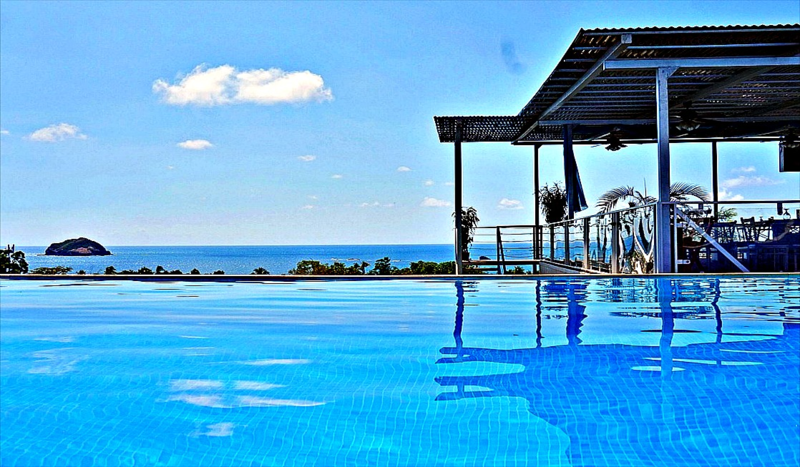 Enjoy the views from your balcony, infinity pool, or an open air restaurant. Have a delicious meal and wait for a sunset. It will take your breath away! 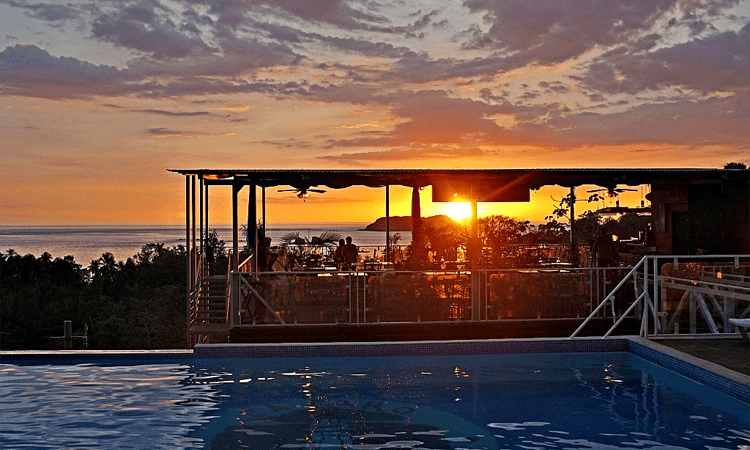 To secure a free four night stay at El Faro Beach Hotel in Manuel Antonio, Costa Rica, I had to make three different reservations from different source of points. It was a little bit of a hassle, but this hotel was my first choice and I knew it was worth the effort. 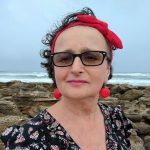 I chose El Faro Beach Hotel primarily for its views and location because this is what is most important to me in my travels. I also knew the rooms had AC which in Costa Rica is crucial. I did not expect much more taking under consideration relatively low rates and the fact that the hotel was built out of recycled shipping containers. The hotel exceeded my expectations. Also my 22 years son, who joined me on this trip, agreed with my opinion. We loved the hotel and would recommend it for budget conscious travelers. 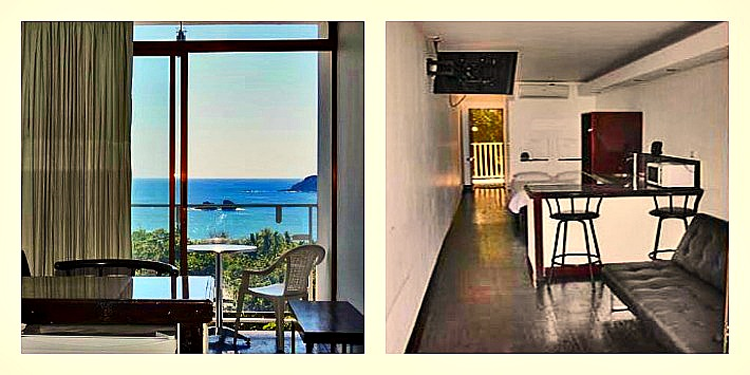 El Faro Beach Hotel sits high up on the side of the hill and overlooks the Pacific Ocean. 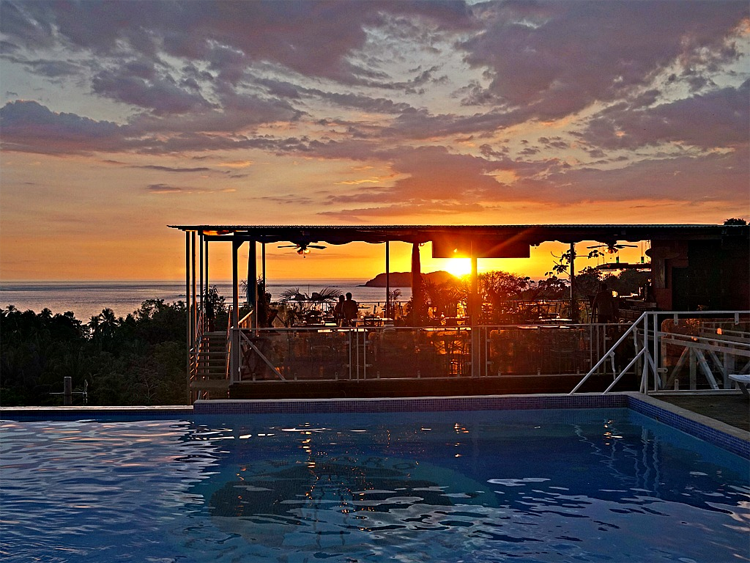 You can enjoy views of a tropical paradise from your own balcony, infinity pool, open-air restaurant connected to the pool, or from a huge rooftop terrace. Sunsets are truly mesmerizing. 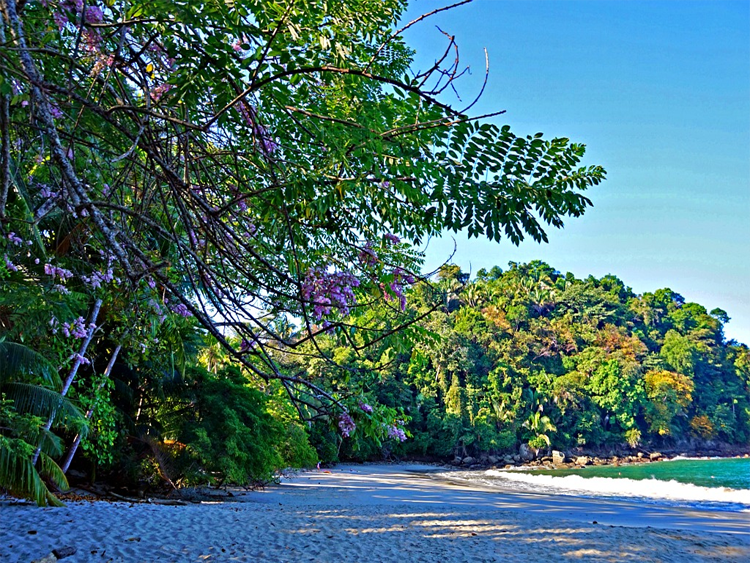 Gorgeous public beach is just a short stroll away. This your place for sunbathing, swimming, or water sports. Across the street from the beach, you will find restaurants, shops, and a grocery story. 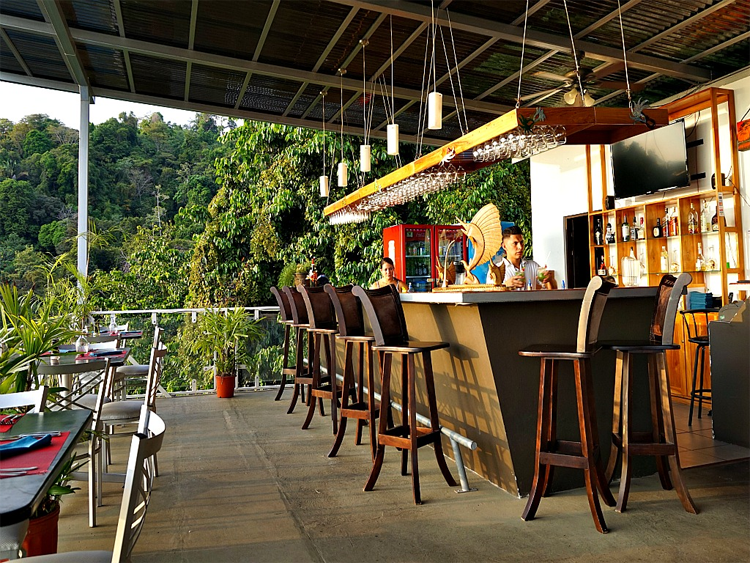 I loved it primarily for the view, but I enjoyed the food and drinks as well. The area was filled with music, most of the time Spanish – my favorite! Service was great. On one occasion, they even kept the kitchen open just for my son who arrived after it was officially closed just to feed him. Room and pool service are available. 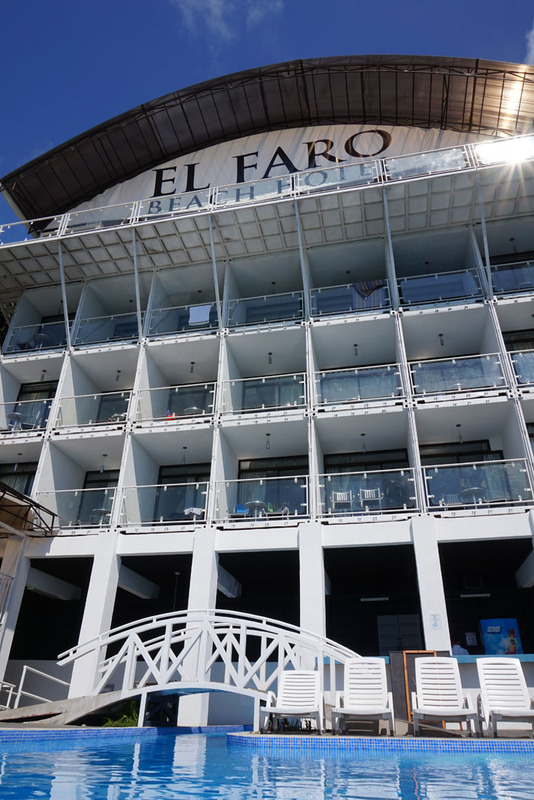 Upon arrival to El Faro Beach Hotel, we received vouchers for a la carte style breakfast. There was a verity of choices from American and Costa Rican menu. Every single item from the list I tried was delicious. It was a lot food and it often kept me going until late at night. The pool and restaurant area at El Faro Beach Hotel is a perfect place to hang out. I loved to cool down in the pool during the heat of the day, but I was also coming back at night. (The pool has not closing hours!) It was a place for social gathering. I met a lot ot interesting people there with whom I am still in touch. I did not expect much from rooms at El Faro Beach Hotel knowing they were made of recycled shipping container, but they were not as narrow as I thought they would be. Actually if I did not know, I would never guess their origin. There was a nice clean bathroom, one double bed for me and a sleep sofa for my son. The room was clean, AC was working properly, and most importantly we had our own balcony with the view! Because of a steep hill and unguarded pools, this hotel would not suit families with small children. Teenagers on the other hand would love it. I loved the balcony but it was a challenge to get there. The door required a lot of strength to get it open and made a lot of noise. It was dead since day one and it was never fixed. Down from El Faro Beach Hotel there is a hostel. The building itself is OK but its roof requires a new coat of paint. Of course I preferred to look at the gorgeous views of the ocean but every time I looked down I saw this ugly looking roof. This is the price to pay for a gorgeous view but you do not have to walk the hill. Guests are transported up and down by golf carts. We never had to wait.